The campaign goal was to take advantage of Heinz’s partnerships with burger restaurants across São Paulo and show people how its ketchup, mustard and mayonnaise products can transform any recipe, thereby boosting brand recognition. Established in 1869 in the US, Heinz is now present in 200 countries around the world. In addition to ketchup, its main products include sauces, meals, snacks and foods for child nutrition. The campaign was titled “Irresistable Posts” and was created by Africa, plus the support of Facebook Creative Shop. To target the local users who look at Stories in Instagram at lunchtime, the app uses geolocation and serves the well-done burgers made by chef Santi Roig from Underdog Meat & Beers restaurant. The idea for Heinz’s “Irresistible Posts” campaign came from a hackathon held in partnership with the Facebook Creative Shop team and the agency Africa. In an campaign designed especially for Stories, the company transformed an appetizing Instagram post into an actual hamburger. At lunchtime on July 24, 2017, Heinz ran an ad in Instagram Stories, using Facebook core location targeting to reach people aged 18–49 within a one kilometer radius of the Underdog hamburger shop (a partner in the campaign). The video ad showed a hamburger being prepared by chef Santi Roig, accompanied by an appetizing question: “Do you want to eat this post now?” By swiping upward, people could quickly sign up to have a hamburger delivered to their homes just minutes later. The Heinz Instagram profile also sent out the order status via a direct message, so everything was monitored in real time. The best part? Everything was free. 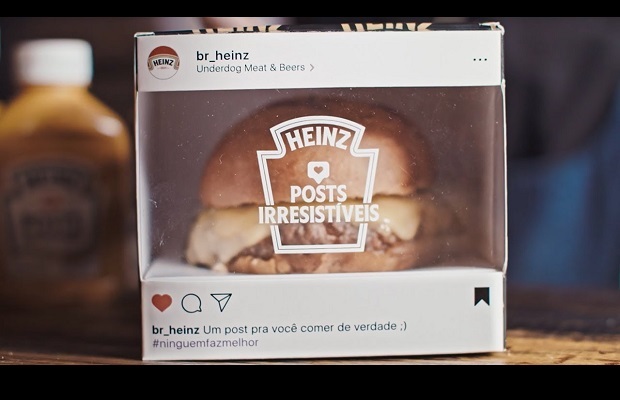 250 hamburgers made with Heinz mayonnaise were distributed in just one hour in the district of Pinheiros, in São Paulo, inside a package designed to look like the original Instagram post. 28% of the people reached by the ad signed up and received the snack. The campaign resulted in an 11-point increase in ad recall for the company, according to a Facebook brand lift study conducted at the end of the campaign.